The database consists of over 5,000 events, which in turn consist of ten fields and a dates range search. A search can consist of a single field or a combination of fields, and include a single a keyword or a short phrase. Category: This field is not currently available. Date Time Group (DTG): The 8-digit DTG represents the month, date, hour and minutes MMDDHHmm). The entire database is driven by the Date Time Group (DTG), and although this field is searchable, its main function is to place events in a chronological order. Sometimes you will see an 8-digit DTG followed by a decimal point and a number (example: 03261752.4). The decimal is used to put several events that happened in a very short period of time in a probable logical order. Due to a lack of information, the order of these events is often a guess on my part. 3/26 Unit field: The 3/26 Unit field is for refining your search to a specific 3/26 companies; I, K, L, M, or H&S. Units have been entered as, for example, L 3/26 (as opposed to L/3/26). Other Unit field: If you are searching for other than a 3/26 unit, you will need to use the Other Unit field. 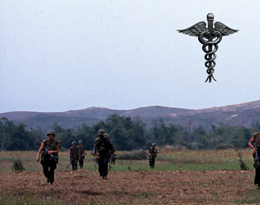 'Other Units' are units which supported 3/26 or 3/26 supported them during an operation. Map Grid: An alphanumeric combination which represents a specific point on a particular map, which in turn represents a specific spot on the ground--a kind of latitude/longitude thing which is used often by the military, only different. MOST of the time the map grid will be a combination of 2 letters and 6 numbers, but a few times in this database you will see a combination of 2 letters and 4 numbers-- and in less than 10 instances you will find a combination of 2 letters and 8 numbers. What does it all mean? Actually it’s pretty simple. The map I just looked at to use as a reference is named Cam Lo (usually named after a geographic location on the map). This map is part of series L7014, and since all of the tactical maps of I Corps are from series L7014, it’s not likely that you will see this number again in the database. The map has a reference number, and in this case it is 6342 1. On the maps, the last number is represented by a Roman numeral (in this instance 1). I have converted them to Hindu-Arabic numerals to make sorting easier in the database. Place: The Vietnamese name of the place, or an American nickname given to a location. Activity: What was happening at this time and place. Casualty: Number of and type of casualty/ KIA = killed in action; WIA = wounded in action; WIAE = evacuate; WIANE = not evacuated; DOW = Died Of Wounds. Start Date & End Date: The system is designed to always search within a range of dates. 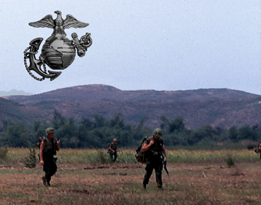 The default range of dates is the Battalion’s entire Vietnam tour, 11 December 1966 to 19 March 1970. How to Change the Date Range: The calendar is quite simple to use. You can insert your curser directly into the field to manually change the date, or you can use the drop-down calendar which appears when you click in the Date field. To do this, click in the date field you wish to change. Then either select the highlight year which appears at the top of the drop-down calendar, or use the arrows to the left and right of the year to advance, or go back to the correct year. From there, you can select the month and then the day. If you are searching for events of a single date, you must enter the same date for the Start and End date. Name: If a name was in the database, this would be the place to find it. Names may also be included in other fields as well. Search All Fields: use this field as a free-form search field. Search for a single word or a short phrase in the search box. Search Button: Hitting the Search button initiates you search. Results: The results of your search, which will include four fields of data, will be listed. If you have more than 100 results, be sure to note the page numbers at the bottom of the results, where you can click through to view all of your events. The Asterisk "*": The Asterisk indicates that the information directly to the left of the asterisk is being questioned. This could be due to a number of reasonable causes such as questionable spelling of a name, or not being certain of the correct, time, date, or whatever of an event. If you know the answer or you think you do, please be sure to share the information by clicking on the 'View" link to the left of the event, and then posting a comment on the event page. Your help would be appreciated. View More Info: Click on the 'View' link to the left of any event to be able to see all the fields for that event in profile view. Note - the Activity field generally contains most, if not all of the pertinent information relating to that event. Most events do not have data in all fields. Comments: If you have any information to share, or have questions regarding an event, while in profile view of the specific event you want to communicate about, please submit a comment. Once your comment is reviewed and released, it will be published where where others can then read, respond, or join in on the conversation. Comments Library: Comments will be listed within the specific event page and will also be shown in the Comment Library. You may have the comments listed by the most recent on top or the oldest on top. From a comment in the Library you should be able to go back to the relevant event.